The mission of USTA Central Arizona is to promote and develop the growth of tennis in the Phoenix Area. Our goal is to make tennis available to everyone! 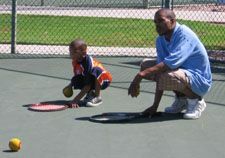 USTA Central Arizona wants to expand our efforts to teach disadvantaged children how to play the game. With the proper equipment (smaller rackets, mini nets and large soft foam tennis balls) and trained coaches, tennis can be fun and easy to learn. We plan to take our equipment to school playgrounds and form partnerships with community organizations to teach children the many benefits tennis has to offer:	self-discipline, concentration, physical fitness and sportsmanship! Your individual donation will make a BIG difference and your gift of $20, $50 or perhaps even $100, if possible, will help purchase the needed equipment and coaching that will make such a difference in the lives of so many children. In addition, your donation to USTA Central Arizona is 100% tax deductible because we are organized under Section 501 ( c ) ( 3 ) of the Internal Revenue code. To make a donation Click Here or contact Larry Funk, Executive Director, at (480) 951-4333 or email Larry@PhoenixTennis.com. Thank you for your support!